When you buy a new computer it is often loaded with extra software that you just don’t need. OEMs are paid by software companies to bundle trial versions in hopes that you will buy the full product. The preloaded junk is a waste of disk space, memory and can even hurt the performance of your new computer so it is a good idea to remove it all. While it is possible to manually remove each extra piece of software on your computer there is a great free tool called PC Decrapifier that will automate the process. 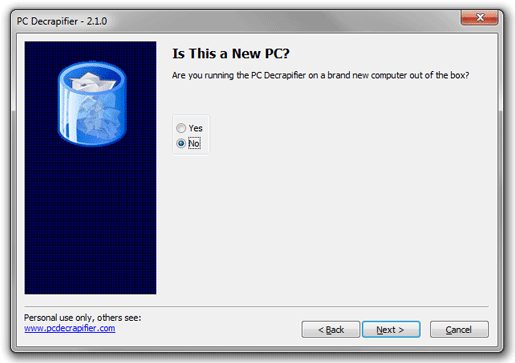 To get started download the latest copy of PC Decrapifier. After the software is downloaded on your computer just run the executable. There is no installer for this software. Click Next on the Welcome, license and Warning screens. Select if you are running the utility on a new computer and then click Next. You will have the option to create a Restore Point that will allow you to revert your changes using Windows System Restore. All of the programs that load automatically on startup will be displayed. Check the programs you want to remove and click Next. Before any items are removed you will have to confirm the changes. Next you will be shown all of the applications installed on your computer. Check the items you want to have uninstalled and click Next. Once again you will have to confirm the changes before they are made. Now PC Decrapifier will work through the list of applications and uninstall each software. Depending on the software you may see additional confirmation screens that you will need to click through to uninstall. Once completed your computer will be a lot cleaner and performing much better!